Why do recent World Championship games appear to be less exciting than in the past? 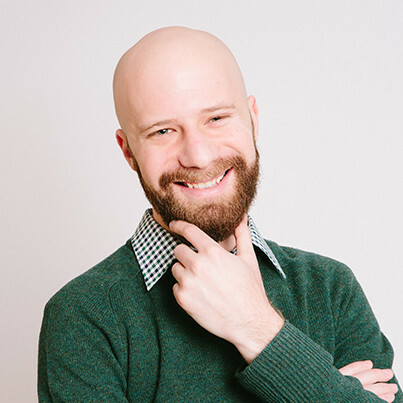 One reason might be that chess engines have made it possible to quickly calculate possible moves in advance of a match, making today's play much more precise than before. 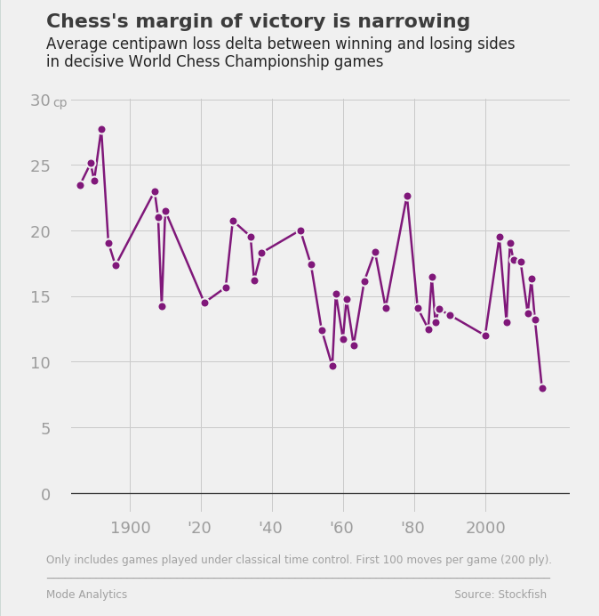 To test this hypothesis and see to how chess has evolved, we took a look back at the World Chess Championship's 132-year history. We analyzed every move played in a World Chess Championship game (over 82,000 moves in total!) using the Stockfish chess engine. For every turn, we used Stockfish to calculate the difference between the move that was played and the best possible move that could have been played, according to a unit of measure called a centipawn. A centipawn is equal to the value of 1/100th of a pawn, so 100 centipawns = 1 pawn. But a centipawn represents more than just a pawn or piece - it's a value representation of advantage, which also takes into account the position and opportunities for both sides. Next, we calculated the average of this difference, known as the average centipawn loss. Since centipawn loss is a measure of distance between the actual move and the best possible move, a lower average centipawn loss indicates more precise play. 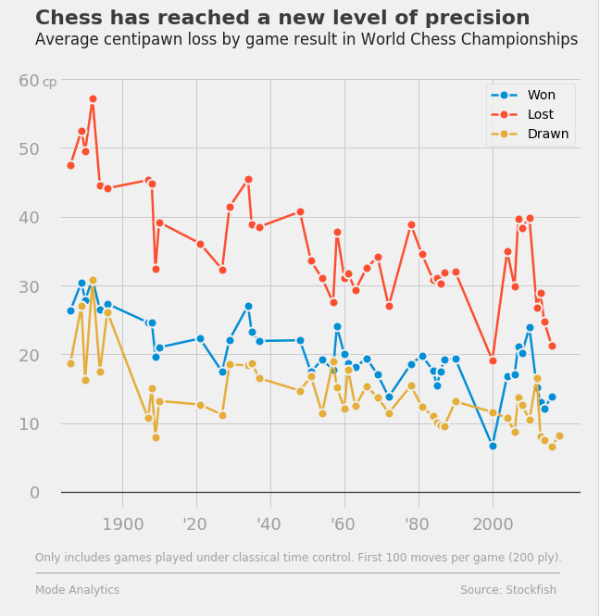 We found that moves played in World Chess Championship games have become remarkably precise, and increasingly so. This trend is not new, but it has accelerated in the last decade. This acceleration is generally chalked up to improvements to chess engines (like the one used to complete this analysis), which allow top players to analyze new ideas and variations much faster during their training. In this year's championship, we saw an average centipawn loss under 10 for the entire 12-game match. While this level of precision made for boring chess in the eyes of some humans, the computers must have loved it. For those who are bored by the ever-more-precise style of play that the computers love, you might be more interested in Fischer Random chess (aka Chess960), where the starting positions are randomized and players have to rely on creativity and improvisation. Ironically, though, you'll be stuck with the same champion for now: Carlsen is also the reigning king in this style of play. Some people are just too perfect. Have questions of your own about World Chess Championship play? Explore this dataset for yourself in Mode's Public Warehouse, or write us at hi@modeanalytics.com — we love hearing from you!